Black Out Tail lights for R60 MINI Cooper Countryman and Countryman S, All 4. For many years MINI owners have wanted the smoked tail lights, well we finally have them and they are DOT legal. These lights have no chrome in them like the original lights which gives them a dark look, but still light up bright. This is a total must have exterior mod to finish the look of your Countryman or Paceman. 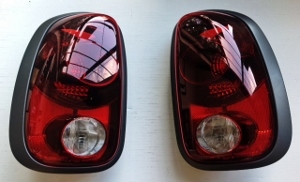 sold as a pair of black out tail lights, one left light and one right light which both lights include the grey black out trim rings as seen in the picture.